Women Serve on Boards’ Olga Mack has published a book to help those interested join a corporate board! Directors, chairmen, CEOs, recruiters, and other professionals who assist boards all reveal that becoming a corporate director is a real journey. The process can take one to five years. It involves a lot of educating, networking, and strategic positioning. In other words, just like everything worth pursuing, it mostly involves a lot of hard work! Yes, there are occasional glimpses of luck. But there are definitely no “magical” moments, invisible hands, or other miracles. This book is a practical beginner’s guide for anyone considering becoming a director, from young professionals seeking board service in the future, to seasoned professionals contemplating an imminent career change. 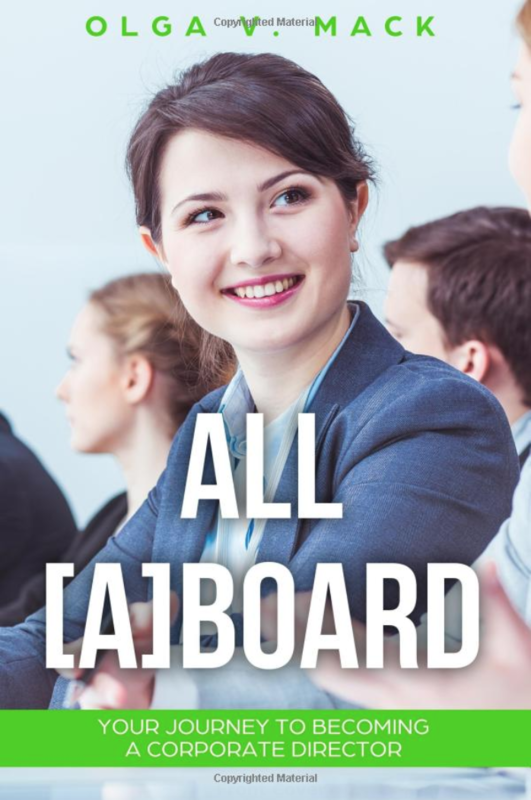 This book answers the most common questions about board service and demystifies the board journey process. It also provides examples of successful board member biographies and resumes. Finally, it shares actionable strategies and helpful worksheets that you can use today. After reading this book, any professional will be convinced that corporate board service is within their reach — and be ready to pursue it! It is available for purchase on Amazon. Want to stay in touch? Enter your information below to be notified of the Women Serve on Boards progress!